"Sampath Speaking" - the thoughts of an Insurer from Thiruvallikkeni: 1500M top 4 finishers in Rio Paralympics 2016 out run Rio Olympian Gold medalist !! 1500M top 4 finishers in Rio Paralympics 2016 out run Rio Olympian Gold medalist !! Singapore's first-ever double gold Paralympian shared an emotional photo of herself celebrating with a veteran team mate who had just won her first medal after four Paralympics ~ and it went viral !! Many of us followed the 2016 Summer Olympics commonly known as Rio 2016, held in Rio de Janeiro, Brazil, from 5 August to 21 August 2016. More than 11,000 athletes from 207 National Olympic Committees, including first time entrants Kosovo, South Sudan, and the Refugee Olympic Team, took part. With 306 sets of medals, the games featured 28 Olympic sports, including rugby sevens and golf, which were added to the Olympic program in 2009. Though the motif is participation, the World remembers winners ! Jamaican sprinter, superstar and crowd pleaser, Usain Bolt, ran into the record books in Rio with his ninth Olympic gold medal. His final glory came with victory in the 4x100-meter relay after finishing first in the individual 100m and 200m. He has repeated this astonishing feat at three successive Olympic Games -- a unique "Triple-Triple." The fastest man on the planet has not retired yet but has declared that Rio will be his last OIympics. Olympic swimming legend Michael Phelps won his 23rd gold medal in the 4x100m medley relay in Rio. He swam the butterfly third leg that helped the US team break the Olympic record. Nicknamed the "Baltimore Bullet," Phelps made his fifth Olympic appearance over 16 years, won his fifth medal of the Rio Games and cemented his place as the most decorated Olympian of all. He now has 28 medals in total but told fans on Facebook that there would be no more. He was beaten just once in Rio -- in the 100m butterfly -- by Singapore's Joseph Schooling, who had been inspired by Phelps and was photographed with him as a youngster. The men’s 1500m final was one for the ages, although not in the way you might expect. The gold medal was won in a time of 3:50.00, the slowest time since 1932, and the last time there was a US winner at this distance in the Olympics was back in 1908. Matt Centrowicz, the two-time World Championships medallist, with a bronze in 2011 and silver in 2013, completed his collection of medals from outdoor global championships after controlling the race almost from the gun and repelling all the attacks from his rivals, especially over the final 250 metres. Centrowitz, surprisingly to many still only 26, towed the field through the first 400m in a sedentary 66.83 and then an even slower second lap of 69.76. Not many of us may be following Paralympic Games, a major international multi-sport event involving athletes with a range of disabilities, including impaired muscle power, impaired passive range of movement, limb deficiency, leg length difference, short stature, hypertonia, ataxia, athetosis, vision impairment and intellectual impairment. There are Winter and Summer Paralympic Games, which since the 1988 Summer Games in Seoul, South Korea, are held almost immediately following the respective Olympic Games. All Paralympic Games are governed by the International Paralympic Committee (IPC). The Paralympics has grown from a small gathering of British World War II veterans in 1948 to become one of the largest international sporting events by the early 21st century. Paralympians strive for equal treatment with non-disabled Olympic athletes, but there is a large funding gap between Olympic and Paralympic athletes. Given the wide variety of disabilities that Paralympic athletes have, there are several categories in which the athletes compete. The allowable disabilities are broken down into ten eligible impairment types. The 2016 Summer Paralympics is being held in Rio de Janeiro, Brazil, from 7 September to 18 September 2016. The Games mark the first time a Latin American and South American city hosts the event, the second Southern Hemisphere city and nation, the first one being the 2000 Summer Paralympics in Sydney, and also the first time aLusophone (Portuguese-speaking) country hosting the event. 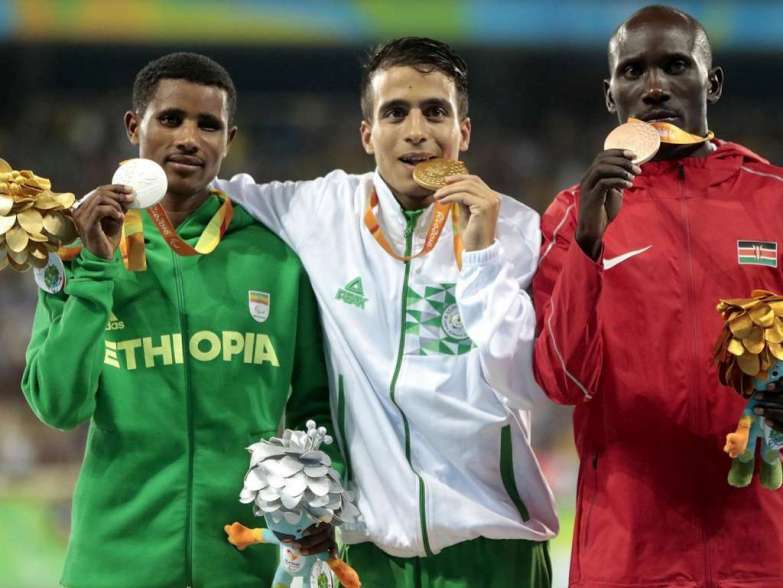 Abdellatif Baka of Algeria claimed the T13 - 1,500m Paralympic title as the top four finishers all recorded times which would have given them Olympic gold. Baka set a world record of three minutes and 48.29 seconds to claim top spot in Rio on Monday, more than 1.7 seconds faster than USA runner Matthew Centrowitz, who won the men's Olympic 1,500m final last month. The Algerian led the way in a T13 class which caters for visually impaired competitors. There are two other categories for visual impairment - T11 and T12 - with the lower numbers indicating more severe impairment. Ethiopian challenger Tamiru Demisse took silver behind Baka in a time of 3:48.49 while Kenya's Henry Kirwa crossed the line in third (3:49.59). Fourth-placed finisher Fouad Baka - the victorious athlete's brother - was just behind Kirwa in a time of 3:49.84. Even that was faster than Centrowitz, who took gold in 3:50.00.